Dr. Amir Khoshbin specializes in adult reconstructive surgery of the hip and knee, including minimally invasive Direct Anterior Hip Arthroplasty (DAA), primary & revision joint replacements, and complex lower extremity trauma. He attended the University of Toronto for his undergraduate and medical education. Dr. Khoshbin completed his residency at the University of Toronto, where he was part of the Surgeon Scientist Program and received his Master of Science in clinical epidemiology. After residency, Dr. Khoshbin completed an Orthopedic Trauma Association (OTA) fellowship in Trauma at Massachusetts General Hospital and Brigham & Women’s Hospital in Boston. Thereafter, he completed a second fellowship in Adult Reconstruction and Joint Replacement at the Hospital for Special Surgery in New York City. 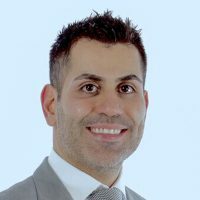 Dr. Amir Khoshbin joined St. Michael’s Hospital as an attending Orthopaedic Surgeon and as an Assistant Professor at the University of Toronto and is currently accepting new patients.